The Apple Home app lets you control HomeKit accessories from an iPhone (or iPad). HomeKit accessories are things such as lights, thermostats, and locks that you deploy around your home. 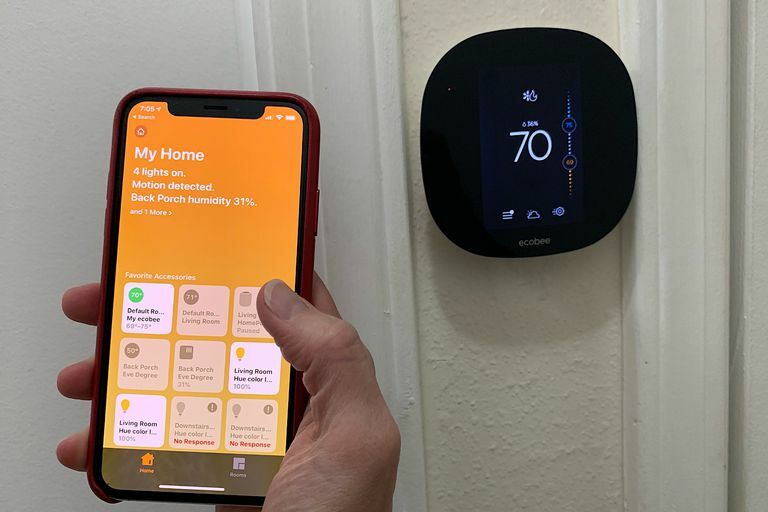 Apple’s HomeKit software framework enables you to connect, manage, and automate these HomeKit accessories from the Home app. To add a device, open your Home app and tap + in the upper right corner, then tap “Add accessory”. Point your iPhone (or iPad) camera at the HomeKit setup code, which is typically either on the accessory, on the accessory’s box, or on included documentation. Some devices require an additional bridge in order to work with HomeKit. For example, to connect and control the widely available and popular Philips Hue lights, you’ll need the Philips Hue Bridge. The bridge connects to your network with an Ethernet cable and accepts HomeKit commands, which it then relays to connect Philips Hue devices. In some cases, you’ll use a manufacturer’s app to add an accessory. Once you’ve added a Hue light bulb in the Hue app, for example, the app will sync information about the light with the Home app. Once a device is connected, you can view favorite device information in a square representing each accessory on the main Home app screen. The square displays the name of the device, along with some basic status information, depending on the type of device. A connected light, for example, might show a portion of the device name, the device type (e.g., a color or white light), and the current device status (e.g., “On” or “Off”). A connected thermostat might display the current temperature range setting (e.g., 69–75 degrees), while a connected lock might show the lock name, location, and status (e.g., “Locked” or “Unlocked”). Tap on the displayed square in the Home app to access additional controls. Tap a thermostat, then adjust the temperature control range. Tap a light, then adjust a slider to control brightness, adjust color, or other settings. A tap on the app status in the Home app can also toggle the status of some devices: Tap on a lock, for example, to either lock or unlock the device. The Home app allows you to create Rooms, then place devices into Rooms. You may then apply a command to every item in the room. For example, you might add four different lights into a Room named “Living Room”. Or, you might identify that you have lights, outlets, and a fan in your home office. After you configure your devices, rooms, and scenes within the Home app, you may also choose to use Siri to control each of these with voice commands. For example, you might say, “Hey, Siri, turn on the living room lights” in order to turn on every light within the “Room” you named “Living Room”. This saves time, since you’d otherwise have to individually issue commands to turn off (or on) each and every device in the room separately. You can also make adjustments to sets of Home accessories. Say “Hey, Siri, dim the living room lights to 50%” to reduce the brightness of every light in your living room. Or, “Hey, Siri, Bedtime scene” to trigger defined set of actions that might, for example, turn off your living room lights, and turn on your bedroom and bathroom lights. Automation allows you to program certain things to occur automatically. For example, you might set your porch light to turn on at sunset and then turn off at sunrise. You’ll need to give the app access to your location to allow it to calculate and adjust the sunset/sunrise time throughout the year. But once configured, you’ll have a porch light that always turns on at night with no additional action on your part. Automations can be configured to trigger based on several events, including when people leave, when people arrive, at a specific time of day, when a sensor detects something, or when something occurs to an accessory (e.g., you turn a specific light on). Add a Home hub and you’ll be able to control many accessories remotely from your Home app. A HomePod, Apple TV 4K, or Apple TV (4th generation) can serve as a home hub. (An iPad can serve as a home hub, as well, but a HomePod or Apple TV may be more likely to be plugged-in and powered than an iPad.) Of these devices, the HomePod may be the simplest way to set up a home hub: Use the phone that you used to configure your HomeKit devices when you set up your HomePod. HomeKit will then let you control your HomeKit devices remotely via the HomePod, since they’re all connected to the same Apple ID and iCloud account. With a home hub connected and configured, you can use the Home app to remotely turn lights on (or off), monitor the weather, or adjust the thermostat. Depending on your security choices and settings, you also may be able to remotely control door locks. The Home app on your iPhone connects to the HomePod, which then lets you control connected and powered HomeKit accessories. Often, you’ll need to install the manufacturer’s app to get the most out of an accessory, since the manufacturer’s app typically offers additional data and/or controls. For example, in the Home app, the Eve Degree connected weatherstation device displays the current temperature and humidity. However, the Eve for HomeKit app tracks and displays temperature, humidity, and air pressure data over time. Similarly, the Philips Hue app offers several preset lighting configurations, as well as the ability to apply lighting settings to devices in a room quickly. The app also serves as a way to update Hue device firmware. Third-party apps also often sync data with the Home app. You can use the Hue app to add a new light, and add that light to your “Living Room” set up. The app can sync those settings with your HomeKit configuration, so that the light appears in the correct Room and with the correct status in the Home app, as well.